I’m feeling weak, deprived, and slightly nauseous. I haven’t posted in about a week in a half. I feel ashamed. So, I thought that in order to restore myself to Miss Cupcake status, that I should make you something very “Miss Cup-cakey,” which we all know means something terribly bad for you, inside and out. After consuming this you will probably feel weak in the knees, your face will break out with some terrible rash, and your eyes will start to swell. It just might not be the best idea, but if it was…it wouldn’t be as good, right? So, after being reminded that the Pillsbury Bake off is taking entries until April, I knew I needed to be there. So, I started concocting a list purely devoted to Pillsbury creations. Ohh, I have such wonderful things included on the list, but I just can’t tell you…not yet. However, I decided to try my first go on the list. I was going to save it for the Bakeoff, but two things crossed my mind. Number 1: I just don’t think that something that is 394229 calories per serving will win the bakeoff and Number 2: It’s so wacky, wonky, and interesting…that you need to try it. So, I started by baking up some simple brownies. I added the brownie mix, oil, water, and some peanut butter chips. 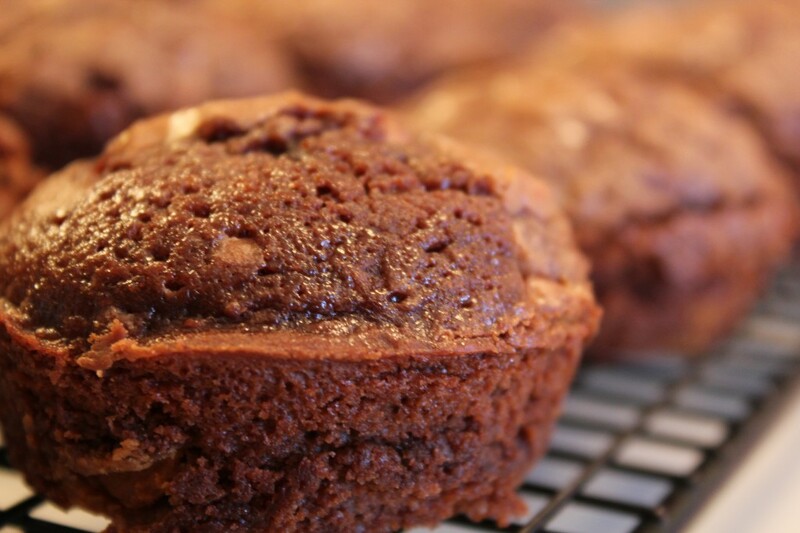 I baked them in muffin tins and took them out of the oven when they were done. However, to my dismay, they never got done. I peaked in to the oven and they appeared to look more like a bubbling geyser at Yellowstone national park. My excitement started to wane. I panicked and started yelling, “I can’t even make BOXED BROWNIES! WHAT HAS COME OF ME!” Shortly after my meltdown, I realized I hadn’t included the needed eggs in the recipe. Crap. Really, Lauren? Really? So we started back at square one…again. Then, after I had actually made a few successful looking brownie bites, I whipped up a vanilla whoopie pie batter and let the brownie go for a skin bleach. 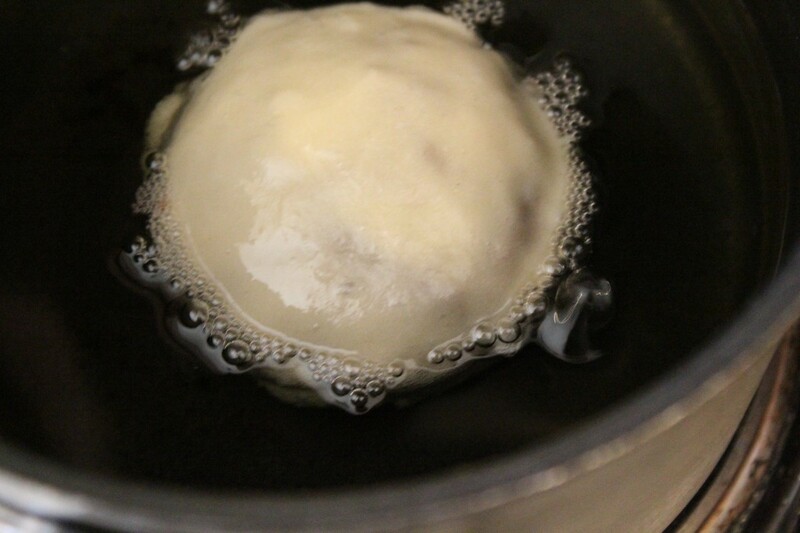 Get your oil, and turn it on medium for 3-5 minutes, being careful not to burn it. Plop the bad boy in there and let it swim for about 20-30 seconds on each side…depending on how hot your oil is. Here it is my friends. 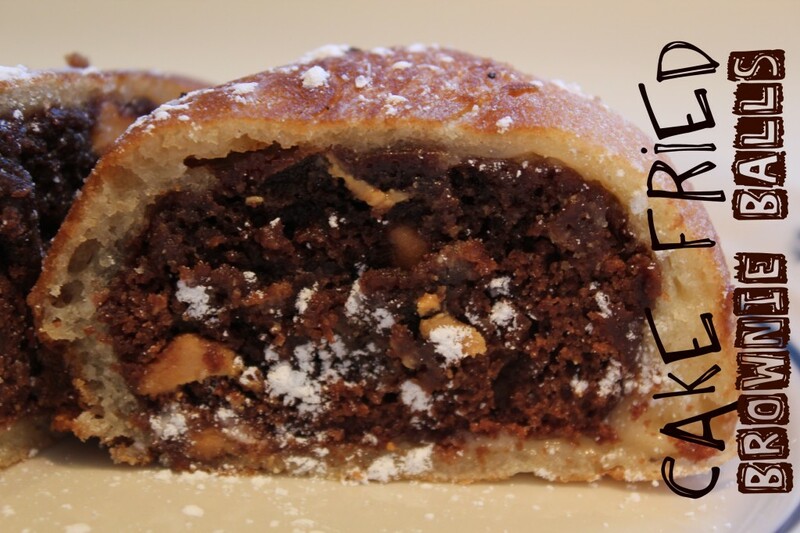 The technical name is as follows: Peanut Butter Fudge Brownies Covered in a Fried Whoopie Pie Cake Shell. All that you need to do now is cover it in some powdered sugar…for that dainty look. Heck, where is the vanilla ice cream!!?? Preheat oven to 350*F. Spray 2 cupcake tins with cooking spray. 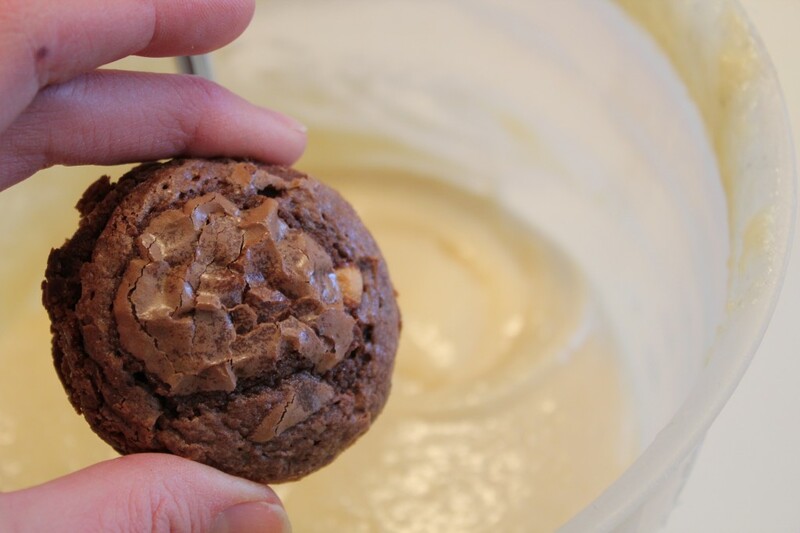 Mix up brownie batter, add peanut butter chips. Using a cookie scoop, divide the batter among 24 cups. Bake for 18-22 minutes, they are done when a toothpick comes out clean. 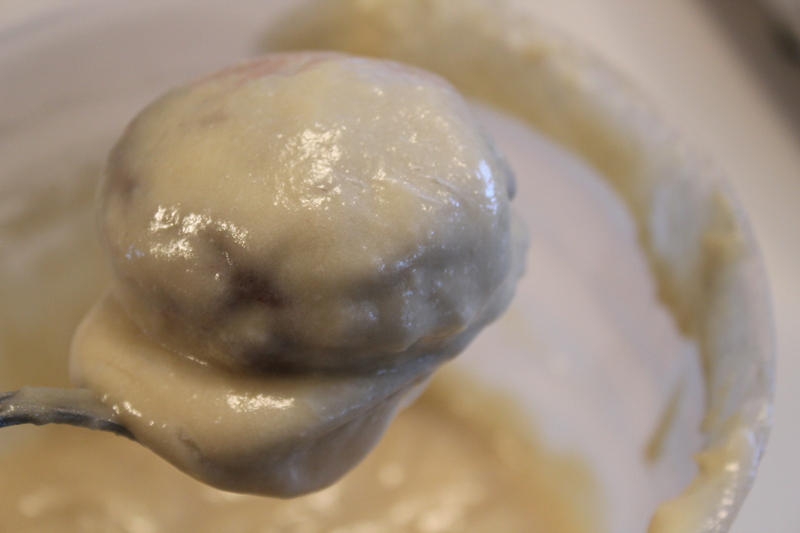 Let cool, meanwhile, mix up the cake batter by combining the cake mix, oil, water, eggs, and flour. Heat oil. One by one, coat the brownie bites in batter and fry for 2-30 seconds on each side. They will look golden brown. 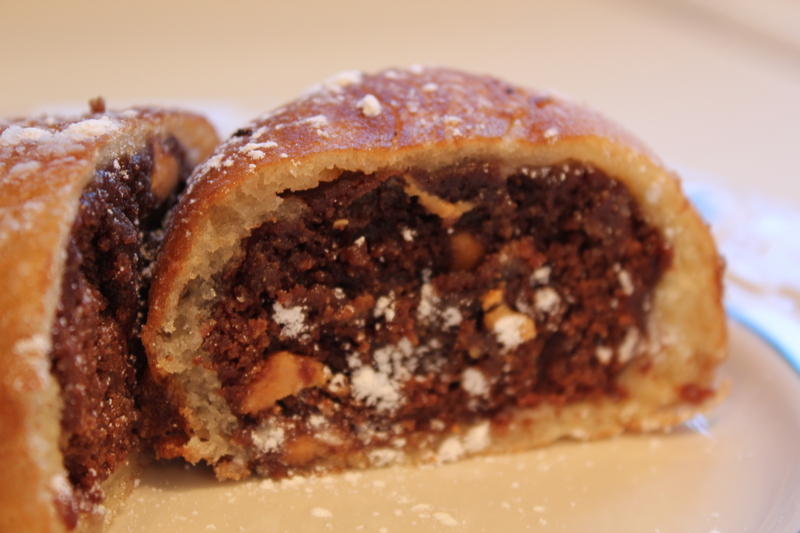 Enjoy with a tall glass of milk, some powdered sugar, maybe a scoop of ice cream…or two…and hmm..chocolate syrup! Prepare to be dazzled..in more ways than one!